As most of you are no doubt aware, the Alpha card list was released yesterday, and there’s a whole bunch of great new cards in there along with the stuff we’ve seen before! Today I’m going to go over some of my personal highlights. First up we have Eldritch Dream. This card caught my eye almost immediately, and it has incredible potential. A 3ATT/3DEF Unblockable troop would already be a pretty good bargain for 4 resources, but this thing can also take a Major Gem, massively increasing its flexibility and overall power. Give it the Major Ruby gem for example, and every time it deals damage the enemy is going to be losing a resource, or give it the Blood Minor and force your opponent to be discarding cards every time it lands. There are a whole bunch of different gems you could give this thing to cause your opponent problems or to give yourself a nice little boost. Really, the only weakness of this card is that he’s likely to be a magnet for whatever removal your opponent has to throw at him. I could easily see this finding a home in a great many Sapphire decks. The art here is super-creepy too. 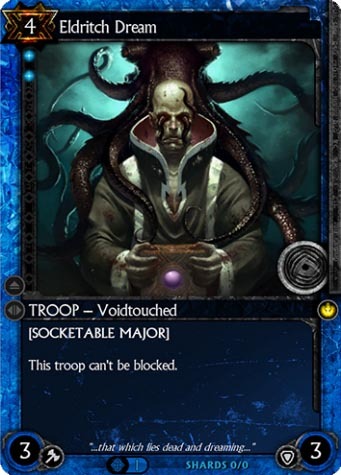 We don’t know much about the Void from a Lore standpoint, but it certainly looks like they are able to reach into Entrath with their squiddy tentacles to work their will. The Blood Cauldron Ritualist isn’t a new card – in fact it was one of the first cards we saw all those months ago! Really I just wanted to bring it up because of the fantastic new art it has. 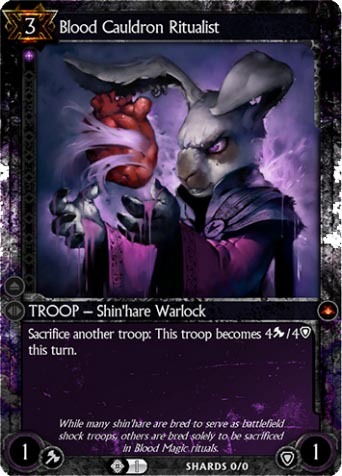 I was never a fan of the original art this card had – I thought it looked more like a stuffed rabbit doll hanging another stuffed rabbit than anything sinister, and this new illustration is better by many orders of magnitude. This isn’t the only card that has seen its art upgraded – Sword Trainer, for example also has some great new art and there are a number of other existing cards that have shiny new images attached to them. Hex is one of the best looking card games ever made, so it’s nice to see Cryptozoic doing everything they can to make each card look amazing. I have no idea what’s actually going on here. Reversion is interesting because of how unique to Hex it is. 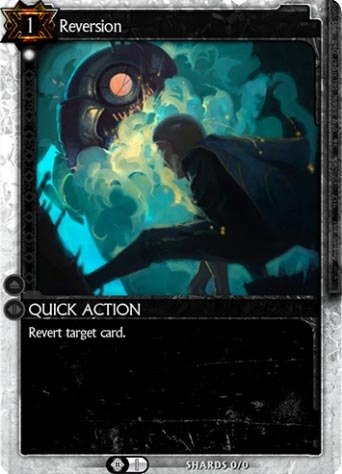 Cards in Hex are able to permanently retain any buffs or other changes made to them, regardless of what happens to them – whether killed or bounced to your hand or whatever – and the Revert effect is how you strip all of those things away, returning the card to the state it was in when it was first played. Of course, we’ve seen cards that Revert before, like the Boltpaw Wizard, but a low cost Quick Action revert effect is going to be a very important card to the Set, I imagine, and will likely be pretty popular in many Diamond decks. Magic swords are where it’s at. 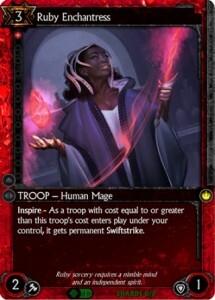 Ruby Enchantress is a card I really like simply because I’m a big fan of the Swiftstrike effect, and being able to Inspire that effect onto other troops strikes me as something that could be incredibly powerful. She’s also the only new Inspire troop revealed in the Alpha spoiler, so I wanted to give her a mention to round out my previous Inspire article. One thing I did find interesting is that the Inspire troops that give keywords no longer actually have the keywords themselves – the Shield Trainer no longer has Steadfast, and Lord Alexander no longer has Speed. Princess Victoria isn’t currently in the alpha as of yet, but it’s beginning to look like she won’t have Lifedrain herself either. You may recognise the art of this card from my previous update, where I theorised that it may be from a card similar to Magic: The Gathering’s Overwhelming Stampede. It isn’t, obviously (though a similar card did appear in the form of Onslaught), but the actual card is much more interesting – the long awaited Wild Escalation card! 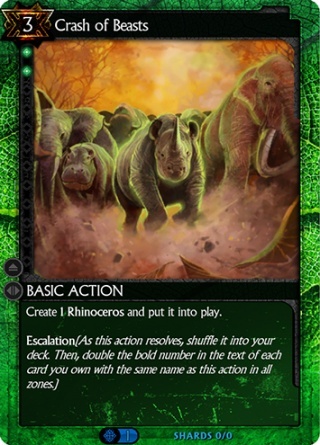 The effect on this card is, frankly, nuts – for 3 resources, you create a Rhinoceros and then escalate the card. This means that the next time you play it you’ll get 2, and then 4 the time after that. This is insanely good value, since 3 resources for even a single Rhino is a pretty good deal, so I can easily see this card being extremely popular. I know I can’t wait to try it out! Before this card was revealed, the effect it had guessed it would have was creating Battle Hoppers – I’m glad I was wrong, as I’d take a Rhino over a Battle Hopper any time! The Fist of Briggadon is pretty much the literal embodiment of the Wild shard – a huge, unstoppable juggernaut who exists solely to smash your enemies into pulp. And at a mighty 7 attack and 7 defence, with both Invincible and Crush, this guy very nearly is unstoppable. 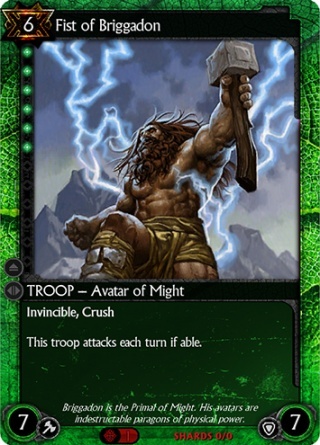 No surprise that he requires 6 Wild threshold, which basically means he will only ever be appearing in pure Wild decks! For those that don’t know, Invincible means that he can’t be destroyed by damage, and he’s immune to effects that directly destroy troops too. This means that cards like Burn don’t effect him, he can’t be Murdered, and you won’t be able to kill him in combat. So, how do you survive against this beast? With great difficulty, frankly. Cards like Inner Conflict will successfully stop him in his tracks, and the bounce effect caused by something like Buccaneer will offer you a brief reprieve, but otherwise you’re going to need to use something like the Chaos Key to void him out of existence. Avatar of Might indeed! 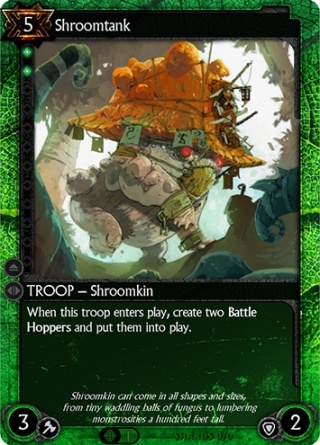 My personal favourite out of all the new cards, though, is the Shroomtank. As far as I’m concerned, there’s nothing not to love about this thing! Like his cousin the Mushwocky, he may not have the best of stats, but what he lacks in raw power he more than makes up for in charm! He even comes with the two Battle Hoppers that are riding him around into battle! Great for chump blocking, or as sacrifice fodder for something else! Anyway, the art of this thing is great and I’m a sucker for Shroomkin as I’m sure regular readers know, so my love of the Shroomtank should come as no surprise. Of course, these are just my personal highlights of the alpha spoiler. There are plenty of other great cards in there, along with some expected but important effects – like Nature Reigns, which lets you destroy Constants and Artifacts – and others which are just plain cool. Once you’ve checked out the full card list for your self, why not drop a comment below and tell everyone what your own favourite card from the list is! Alpha is upon us! The first wave have received their invites and the community is in full swing. Here are a few bits and pieces worth checking out! – Somehow, bogycoins over at the Hex TCG Browser has already managed to get all of those new cards into the database, which is why all those nice card highlights above work. I’m fairly certain he must be a cyborg. Anyway, if you want to see all the cards in a nice browsable list, check it out! – MSB’s Card Breakdown series finished last week with everyone’s favourite Dragon, Uruunaz! The whole series is great and he’s going to be continuing with the Hex content, so be sure to keep an eye on his Youtube channel! – HyenaNipples over at Hex Shuffle has a great guide for Magic players who are thinking about making the jump to Hex! If you’re unsure just how our beloved Hex differs from MtG, check it out! There’s a great deal of high quality Hex content being produced recently, far too much for me to reasonably list here. If you want to see more, though, be sure to check out the sites in the Links section – I try and keep it up to date with active sites that regularly have new stuff to read, so you should definitely be able to find something there! The Casual Hex booster raffle is still open for entries – you can find full details here! To summarise though, you have 3 ways of entering – you can Like our Facebook page, follow us on Twitter or comment on this article below! Facebook Likes, Twitter follows and commenting on the site here are 3 separate raffles, so if you do all three you have three chances to win – the competition ends on October 25th, and the 3 winners will all get some free boosters! With a little luck, by the time my next article goes up I’ll have access to the alpha myself and will be able to give you my impressions. Fingers crossed. That’s all for now! Check back next time, when I reveal the mystical secret behind turning cheese into gold! This entry was posted in Alpha, Cards and tagged alpha, awwww yeeeeah, highlights, shroomtank, spoiler by Icepick. Bookmark the permalink. Wild is so powerful right now. Ramping into a turn 3 Fist of Briggadon is going to be ridiculous. My favorite spoiled card is Eldritch though. I’m dreaming up a ruby/sapphire to socket Eldritch with a ruby to destroy resources. I think buffing necessary sacrifice and extinction make for some interesting changes to the blood side. Adding a wild troop that gives a wild threshold and exhausts to give a resource is great. The frost wizard diamond troop and sapphire mimic card makes for some interesting effects that I would like to know how they work in game. Wild seems pretty strong. I just hope newer cards will make the others more competitive. I really like the artwork for Ruby Enchantress, I don’t know why, I’m just drawn to it. 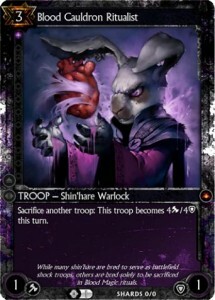 However Eldritch Dream is a beast, i got a feeling that card is gonna ruin a few people days. Eldritch Dream would be very potent in a sapphire-ruby deck. Crash of Beasts doesn’t look overpowered to me, it has a high cost for an Escalation card. I must admit, the Alpha has come at a weird time for me. School’ll be crazy hectic through at least next week, and possibly the rest of October, and most of my focus has been spent on the release of the new Pokemon game (picking it up tomorrow night, gonna spend all Saturday vegging out on it before I have to get back to midterms). I downloaded the alpha spoilers, and I just haven’t had time to read through them all yet. Got through the artifacts and the Blood cards, gotta finish that up when I have some free time. Hopefully by the time my alpha invite arrives I’ll be all caught up. Thanks for the great run-down of some of the highlights here, it’s been easy to let my Hex excitement burn low, but I can’t wait to get in there and give the game a whirl. Couldn’t agree more regarding the Blood Cauldron Ritualist art. That had some of the worst art ever. So glad that Cryptozoic is spending some of that Kickstarter money on hiring decent fantasy artists. I know card art is the last thing that matters (to players) but for new players it can be a real stumbling block. People start assuming that because the art is crap the game must be as well. I don’t really know if i should post this, but there is a full list of the 414 cards present in the database for hex. Of course, for now there is not every pvp card in the alpha, but the cards missings are missing because of bugs and such, not because of tuning, so there won’t be major change like they did previously.